Highly bacillated lepromatous patients (BL/LL) with an initial bacterial index (BI) of 4 to 6+ are being treated with a modified World Health Organization-recommended multiple-drug therapy (WHO/MDT) regimen consisting of rifampin 600 mg once a month, clofazimine 100 mg on alternate days, and dapsone 100 mg daily. The clinical and bacteriological profiles of the patients who had discontinued treatment at different durations have been compared with patients who took the same treatment until attainment of smear negativity. All six of the patients who had discontinued treatment at 12-18 months had worsened clinically and bacteriologically, and viable bacilli could be demonstrated in those tested for ATP. In four patients who had stopped treatment at 24-30 months, the BI continued to fall and there was no clinical or bacteriological worsening in 1 to 2 years of follow-up. The fall in the BI in five cases who had discontinued treatment at 36-44 months was comparable to those on continuous treatment, and there was no worsening. These observations indicate that with the conventional MDT regimen it is not advisable to stop treatment at 12 and 18 months. It appears that treatment should be continued for at least 2 years, and longer in the untreated highly bacillated cases. Prospective clinical trials with a sufficient number of cases and long-term follow-up need to be carried out to ascertain the optimum duration. Des patients lépromateux fortement bacillifères (BL/ LL) avec un indice bactérien initial (IB) de 4 à 6 + sont traités par un régime polychimiothérapeutique modifié par rapport à celui recommandé par l'Organisation Mondiale de la Santé. Ce régime consistait en rifam-picine 600 mg une fois par mois, clofazimine 100 mg un jour sur deux, et dapsone 100 mg par jour. Les profils cliniques et bactériologiques des patients qui avaient arrêté leur traitement après différentes durées ont été comparés aux patients qui ont suivi le même traitement jusqu'à la négativation des frottis. Tous les 6 patients qui avaient arrêté leur traitement après 12-18 mois s'étaient détériorés du point de vue clinique et bactériologique, et des bacilles viables pouvaient être mis en évidence chez ceux qui ont été testés pour l'ATP. Chez 4 patients qui avaient arrêté leur traitement après 24-30 mois, l'IB continua à diminuer et il n'y eut aucune détérioration clinique ou bactériologique au cours du suivi de 1 à 2 ans. La diminution de l'IB chez les 5 patients qui avaient arrêté leur traitement après 36 à 44 mois était comparable à ceux poursuivant leur traitement, et il n'y avait aucune détérioration. Ces observations indiquent qu'avec le régime PCT conventionnel, il n'est pas à conseiller d'arrêter le traitement après 12 ou 18 mois. Il semble que le traitement doit être poursuivi pour au moins deux ans, et plus chez les malades fortement bacillifères non encore traités. Des essais cliniques prospectifs concernant un nombre suffisant de malades et un suivi à long terme doivent être entrepris pour déterminer la durée optimale de traitement. Se están tratando pacientes lepromatosos (BL/LL) multibacilares (con índices bacteriológicos, IB, iniciales de 4+ a 6+), con un esquema de tratamiento modificado del propuesto por la Organización Mundial de la Salud, con múltiples drogas. El tratamiento consta de 600 mg de rifampina una vez al mes, 100 mg de clofazimina en dias alternados, y 100 mg diarios de dapsona. Los perfiles clínicos y bacteriológicos de los pacientes que han suspendido el tratamiento en diferentes etapas, se han comparado con aquellos de los pacientes que siguieron el tratamiento hasta que se hicieron bacteriológicamente negativos. Los 6 pacientes que descontinuaron el tratamiento a los 12-18 meses de su inicio, han empeorado clínica - y bacteriológicamente y en ellos, la prueba del ATP ha revelado la presencia de bacilos viables. En 4 pacientes que suspendieron el tratamiento a los 24-30 meses, el IB continuó bajando y no hubo empeoramiento clínico o bacteriológico al año o a los 2 años de seguimiento. La caída en el IB en 5 casos que habían suspendido el tratamiento a los 34-36 meses, fue comparable a la observada en aquellos pacientes que no abandonaron el tratamiento y no hubo empeoramiento. Estas observaciones indican que con el tratamiento convencional con múltiples drogas no es recomendable suspender el tratamiento a los 12-18 meses. El tratamiento debe continuarse cuando menos durante 2 años, o más en los casos muy baciliferos sin tratamiento. Se necesitan más ensayos clínicos, con un mayor número de casos y mayores tiempos de seguimiento, para establecer la duración óptima del tratamiento. Rifampin is known to be a potent anti-leprosy drug and multidrug therapy (MDT) including rifampin considerably shortens infectivity in leprosy (4,5,10). However, the optimum duration of treatment with MDT is not known with certainty, and the general recommendation is to continue the treatment for 2 years or until bacterial negativity, whichever is later (11). Some investigators have suggested that since most of the viable bacilli are killed by a few months of MDT, treatment may be stopped even before smear negativity is attained since the dead bacilli will be cleared from the body over time. This is an attractive proposition, especially for the leprosy control programs, from the point of view of both ensuring patient compliance and economy. Against this, the results of the THELEP trials as well as of studies carried out at Central JALMA Institute for Leprosy (JALMA) indicate that in the initially highly bacillated borderline lepromatous/lepromatous (BL/LL) leprosy patients viable bacilli are present in 9 % 16% of the tissue biopsies even after 2 years of MDT (5,6,10). 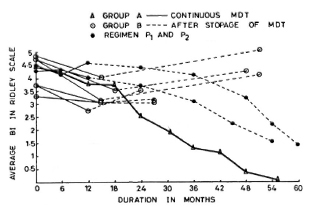 Under these circumstances and without much information about possible safe limits of the remaining viable bacterial load after different durations of MDT, it becomes ethically difficult to carry out prospective clinical trials in highly bacillated patients in whom treatment is terminated after short durations. 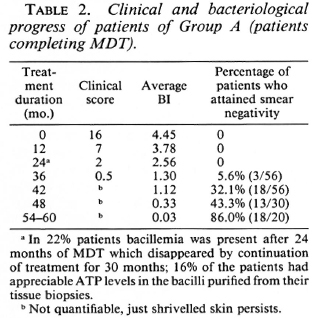 In order to gain some insight into this problem, we have tried to reassess disease activity and bacterial clearance in those patients who had stopped MDT on their own after varying periods of treatment. Untreated BL and LL patients between the ages of 18 and 50 years who had an initial bacterial index (BI) of 4+ to 6+ on the Ridley scale were the subjects of this study. It has been our practice from 1981 - 1983 onward that all untreated BL/LL patients attending our outpatient department (OPD) were treated with a slightly modified WHO regimen (4,5) after a complete examination, charting for assessment of clinical scores and smear testing from four different sites. The regimen used was: rifampin 600 mg once a month (supervised), clofazimine 100 mg on alternate days (unsupervised), and dapsone (DDS) 100 mg daily (unsupervised). We found that 37 highly bacillated, previously untreated, BL/LL patients who had taken regular treatment with the above-mentioned drug schedule, and who had been clinically examined every month, had defaulted at varying periods after starting the above-mentioned drug schedule. We tried to retrieve them by writing to them repeatedly as well as by sending railway concession forms; 17 of these drop-outs responded to our efforts. In these 17, a patient history was taken for intervening drug intake, the urine was tested for dapsone, and they were also examined in detail clinically and bac-teriologically. Fifteen of the 17 patients did not give a history of intervening drug intake, and their urine was also negative for dapsone. Of these 15 patients, 6 had been on the above regimen for 12-18 months (Group B), 4 for 24-30 months (Group C), and 5 for 36 to 44 months (Group D). All of the patients in Groups B, C, and D were examined clinically and bacteriologically after retrieval and their findings recorded. Clinical scores, which include the quantitative assessment of clinical lesions on the body, were determined by the method of Iyer, et al. (3) and as reported by us for Group A patients (patients completing MDT) earlier (4,5). For this purpose, the body surface was divided into seven areas and the lesions awarded scores ranging from 4 for nodules; 3 for plaques and pronounced infiltration; 2 for appreciable thickening and infiltration of skin; and 1 for macules and mild infiltration. The predominant lesions in the area at the time of examination were taken into consideration for the purpose of scoring. The scores so obtained in all of the seven regions were added together to give the clinical score for each examination. The maximum score that a patient could attain was 28. The BI was estimated on the Ridley scale, and ATP estimations were done in two cases by the method of Katoch, et al. (6). Compliance of drug intake was assessed by testing the urine for dapsone periodically (1). These 37 cases had regularly attended the initial mentioned periods of treatment and had defaulted subsequently. A patient was considered "regular" if he took nine supervised doses of rifampin with unsupervised drugs (and was positive on more than 75% of occasions for DDS in urine) in a consecutive period of 1 year. The condition of these patients was compared with that of our earlier reported trial patients who had taken this treatment continuously (Group A) until their smears became negative (4,5). We also compared these results with those reported by Pattyn, et al. (9) for his patients on different fixed-duration multidrug regimens (P1 and P2). Group B. The BI of the six patients in this group at the start of MDT was 4.8,4.75, 4.75, 3.75, 3.75, and 3.3 (mean 4.2). At the time of discontinuing therapy (12-18 months later), these patients had shown clinical improvement with regression of their nodules and infiltration, and their clinical scores had fallen from 14.8 (mean) to 6.1 (mean). Bacteriologically they had also improved (BI = 4, 3.5, 3.1, 3, 2.75 and 3, respectively, mean 3.2) (Table 1). These clinical and bacteriological improvements were similar to those in Group A. (All of the Group B patients had stopped treatment at 12-18 months.) Three of the six patients in Group B were retrieved after 1 to 1½ years, and the other three were retrieved 3 to 4 years after stopping therapy. By this time, all of these six patients had clearly worsened clinically (clinical scores ranging from 8 to 17, Table 1), and in two there were many fresh nodules on the face and body. Bacteriologically also there was an increase in their BI (Fig. 1). In two patients in whom biopsies could be done, the bacilli in the tissue biopsies had significant amounts of ATP. Fig. 1. Comparison of change in average BI in patients on continuous MDT (Group A); those patients who dropped out after 12-18 months of treatment (Group B) and Regimens P, and P, of Pattyn, el al. (9)in whom the treatment was terminated at 12 months. Group C. The four patients in Group C had taken treatment for 24-30 months regularly and then had stopped treatment on their own. The pretreatment Bis of these patients were 4.9, 4.9, 4.0 and 4.0 (mean 4.4). The BIs of these patients at the time of discontinuing therapy were 3, 2.5, 2.5 and 0.75, respectively (mean 2.2). At the time of review (1-2 years later), none of these patients showed any clinical or bacteriological deterioration (Fig. 2). One patient who had defaulted when his BI was 0.75 (after 28 months of continuous therapy) was smear negative when we examined him again 1 year later. The other three patients were still smear positive although the current BIs were lower than those found at the time of their stopping treatment on their own. Fig. 2. Comparison of change in average BI in patients on continuous MDT (Group A) and those patients who dropped out after 24-30 months of MDT (Group C). 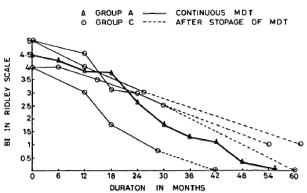 Group D. The five patients in Group D had taken continuous therapy for about 36 to 44 months. The pretreatment BIs of these patients were 4.8, 4.2, 4.0, 4.0 and 3.9 (mean 4.18). Their BIs at the time of their discontinuing treatment were 1, 1, 1.2, 1.2, and 0.3, respectively (mean 0.9). At the time of review (1-2 years later), all of these patients appeared to have maintained their improvement and their disease was judged to be clinically inactive. Bacteriologically they were all negative. Group A. Fifty-six patients, the results of which have been reported earlier (5), took the above treatment until attainment of smear negativity. Their mean pretreatment BI was 4.45, which is comparable to the BIs of Groups B, C, and D and the unretrieved drop-out cases (Table 2). Comparison of retrieved and unretrieved defaulters. Twenty patients who had discontinued treatment did not respond to our efforts to retrieve them. Ten of these patients had taken the modified WHO/MDT regimen for 12-18 months, 6 for 24-28 months, and 4 for 36 and more months. The mean pretreatment BI of these unretrieved patients was 4.5, comparable to the BIs of Groups A, B, C, and D and the BIs of the patients in the P1 and P2 regimens. The mean BI for the 10 patients who had taken treatment for 12-18 months at the time of discontinuing treatment was 3.4 (compared to 3.2 for Group B); for the 6 patients who had taken treatment for 24-28 months, it was 2.8 (compared to 2.2 for Group C); and for the 4 patients who had taken treatment for 36-44 months, it was 0.75 (compared to 0.9 for Group D). It will thus be seen that the mean BI of the unretrieved patients was comparable to those of the corresponding groups (Groups B, C, D) patients wc managed to retrieve. At present the recommendations of WHO (11) are that the treatment with MDT should be continued in highly bacillated multiba-cillary patients until smears become negative or for 2 years, whichever is later. However, it has been hypothesized by a few investigators that MDT need not be continued until smear negativity and that treatment may be stopped earlier since most of the viable bacilli would have been killed by a few months of MDT. In support of such a view are the studies reported by Pattyn, et al. (8,9). In a study of Pattyn, et al. (9) in which P, (rifampin 600 mg twice a week for 6 months and dapsone 100 mg daily for 1 year) and P2 (rifampin 600 mg twice a week for 6 months, prothionamide 500 mg daily for 6 months, and dapsone 100 mg daily for 1 year) regimens were given for 1 year, the patients had not worsened clinically and a slow fall in their BI was also noted. In another study by Pattyn, et al. (8) a very intensive treatment schedule with daily and weekly rifampin, ethionamide and dapsone was tried in a heterogeneous group of treated and untreated patients with BIs of more than 2, and it was found that the BI continued to drop when treatment was stopped after 1 year. However, the reported viability studies of THELEP trials and the results of studies from Central JALMA Institute indicate that even after 2 years of MDT at least 9%-16% of the highly bacillated patients harbor viable bacilli. We therefore felt that without much information about possible safe limits of remaining viable bacterial load, it would be unethical to carry out a trial by stopping treatment at varying periods in one group of patients and follow them up. We chose the alternative of seeing what had happened to those patients who had stopped therapy on their own, after varying periods of treatment, by retrieving the drop-out cases and examining them. We realize that we could retrieve only about 50% of the defaulters and that the retrieved cases need not necessarily be a true sample of the drop-outs or of those continued on treatment. However, we found that the average initial BI and that at the time of defaulting of patients who were retrieved and those who did not respond to our queries were comparable. These patients are also comparable to patients of Groups A, P1 and P2. Therefore, it seems reasonable to assume that at least a good proportion of such cases will behave like the retrieved patients in the study, and that the results of this study are worth reporting since they seem to reflect trends which correlate with the duration of treatment and thus appear to be therapeutically meaningful and consistent. In the present study, all of the six patients in Group B had treatment for 12-18 months, and they all deteriorated clinically (Table 1) and bacteriologically (Fig. 1) after they discontinued treatment. The mean clinical score after 24-36 months was between 0.5 and 2 in continuously treated patients (Group A, Table 2), whereas in the case of the three defaulters in this group clinical scores were 10, 12, 8 (mean 10) at this duration. Similarly, clinical scores in those who were continuously treated were not quantifiable after 4 years of treatment (Table 2); whereas in the three defaulters available for follow-up at that duration these were 17, 14 and 14 (mean 15). This shows that these cases had clearly deteriorated clinically from the time they dropped out. The trend that the BI had taken in these patients, as observed at the time of review, was in striking contrast with that in Group A patients who had continued treatment. It will be seen from Figure 1 that in patients on regular treatment the rate of fall of the BI was rapid in the 18-36 month period. On the other hand, in those who had stopped treatment around 12-18 months the BI had remained either stationary or, more often, it had increased considerably. These patients were regular as evident from clinical attendance and urine spot test results, and their initial clinical and bacteriological progress was also similar to patients of Groups A, C, D. Evidently this worsening has to be attributed to premature stoppage of treatment. In the two patients in whom ATP estimations could be done, significant viable bacillary populations were detected in the tissue biopsies. These levels (53 pg and 258 pg per 106 bacilli) were almost like those observed in untreated lepromatous patients (6). Despite the small number in this group, the consistent worsening of all of them makes us feel that 12-18 months of therapy with the conventional regimen will not be adequate for highly bacillated, previously untreated BL/LL cases. Our results are thus not in agreement with those of Pattyn, et al. (8,9) mentioned earlier. However, it needs to be emphasized that Pattyn's patients received much more intensive rifampin treatment, i.e., 52 rifampin doses in P1, P2 regimens (9), and 180 rifampin doses in other regimens (8), as compared to a maximum of 12-18 rifampin doses in our Group B patients. These differences might be responsible to some extent for the varying responses recorded by Pattyn, et al. (8,9) and by us in the present study. Group C patients had taken treatment for 24-30 months, and they did not show any clinical or bacteriological deterioration despite stopping treatment at that stage. However, as may be seen in Figure 2, the defaulters tended to take longer to become smear negative than those who had continued with treatment (Group A). Our finding of a progressive fall in the BI in these cases corroborates the observations of Ganapati, et al. (2) and Pannikar (7). Group D patients had taken treatment for 36-44 months. There was no clinical or bacteriological deterioration in any of these cases after stopping treatment. 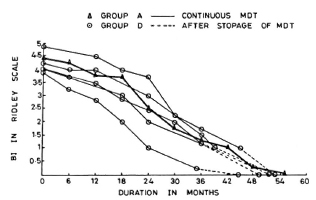 The subsequent fall in the BI and the attainment of smear negativity was similar to that in Group A patients who were on continuous treatment (Fig. 3). Fig. 3. Comparison of fall in average BI in patients on continuous MDT (Group A) and those patients who dropped out after 36-44 months of MDT. The aim of present-day chemotherapy in leprosy is to eliminate the viable bacillary population so that the inputs into the BI cease while degradation of dead bacteria continues and the bacilli are cleared by the body. By initial treatment, a majority of viable bacteria are killed, but some viable population is known to continue to be present in the skin (and probably other foci of the body) even when treatment is continued for up to 2 years (5,6,10). The more rapid and steeper fall in the BI with further treatment can only be explained by further killing of this viable proportion of bacilli by drugs and the clearing of same by the host, thus altering the equilibrium toward negativity. Clinical and bacterial (BI) deterioration of all of the patients who had stopped treatment at 12-18 months indicates that the remaining number of viable bacilli is still not manageable by the microbicidal mechanisms of the body. In contrast, the continued fall in the BI in those who stopped treatment at 24-30 months shows that although some of them might have had some viable bacilli, the host immune system was generally able to contain them. However, this has to be confirmed by follow-up studies and observation of relapse rates. Probably by 36-44 months of continuous treatment the viable bacilli are eliminated more or less completely since the fall in the BI of those patients who had stopped treatment at that stage was similar to those who continued to take treatment beyond 36-44 months. Further, we have also found that bacilli isolated from tissue biopsies at this stage of therapy did not contain any ATP (6). It, therefore, seems reasonable to suggest that the optimum duration of MDT in such highly bacilliferous patients is probably somewhere between 24 and 36 months. Prospective clinical trials with a sufficient number of cases and long-term follow-up will be necessary to verify this. Acknowledgment. The authors are thankful to Dr. H. Srinivasan, Director, Central JALMA Institute for Leprosy, Agra, for critical and constructive review of the manuscript. The technical help by Mr. S. K. Bhan, Mr. A. K. Srivastav, Mr. Satish Chand, Miss Shobha Potdar, and the secretarial assistance of Mr. J. D. Kush-wah is gratefully acknowledged. 1. Balakrishnan, S. Application of a spot test for detection of DDS in urine. Lepr. India 40(1968)1-5. 2. Ganapati, R., Pai, R., Gandewar, K. L. and Thressia, X. J. For how long should a multiba-cillary leprosy patient be treated? Indian J. Lepr. 61(1989)467-471. 3. Iyer, C. G. S., Balakrishnan, S. and Ramu, G. A comparison of low and conventional dosage of dapsone in treatment of LL. Lepr. India 49(1977)372-386. 4. Katoch, K., Ramu, G., Ramanathan, U., Sengupta, U. and Sreevatsa. Follow-up of BL/ LL on a slightly modified WHO regimen of multidrug therapy. Indian J. Lepr. 59(1987)36-43. 5. Katoch, K., Ramu, G., Ramanathan, U., Sengupta, U., Sreevatsa, Sharma, V. D., Sm-vannavar, C. T. and Katoch, V. M. Results of a modified WHO regimen in highly bacilliferous BL/LL patients. Int. J. Lepr. 57(1989)451-457. 6. Katoch, V. M., Katoch, K., Ramanathan, U., Sharma, V. D., Shivannavar, C. T., Datta, A. K. and Bharadwaj, V. P. Effect of chemotherapy on viability of Mycobacterium leprae as determined by ATP content, morphological index and FDA-EB staining. Int. J. Lepr. 57(1989)615-621. 7. Pannikar, V. K. Field trial of fixed duration combined chemotherapy in multibacillary leprosy at Karigiri. Proc. Joint Meeting Indian and THELEP scientists on MDT, Karigiri, 1988, pp. 47-50. 8. Pattyn, S. R., Bourland, S., Grillone, G. and Guys, P. Combined regimens of one year duration in the treatment of multibacillary leprosy I. Combined regimen with rifampicin administered during one year. Lepr. Rev. 60(1989)109-118. 9. Pattyn, S. R., Saint André, P., Ferracci, C. and Baquillon, G. Comparative study of two regimens of combined chemotherapy of one year duration in multibacillary leprosy. Results after four and five years' follow-up. Int. J. Lepr. 52(1984)297-303. 10. Subcommittee on Clinical Trials of the Scientific Working Group on Chemotherapy of Leprosy (THELEP) of UNDP/World Bank/ WHO Special Programme for Research in Tropical Diseases. The THELEP controlled clinical drug trials. Int. J. Lepr. 55Suppl.(1987)864-868. 11. WHO Expert Committee on Leprosy. Sixth report. Geneva: World Health Organization, 1988. Tech. Rep. Ser. 768. 1. M.D., Assistant Director; Central JALMA Institute for Leprosy (ICMR), P.O. Box 31, Taj Ganj, Agra 282 001, U.P., India. 2. M.B.B.S., D.D.V., Research Officer; Central JALMA Institute for Leprosy (ICMR), P.O. Box 31, Taj Ganj, Agra 282 001, U.P., India. 3. M.B.B.S., Research Officer; Central JALMA Institute for Leprosy (ICMR), P.O. Box 31, Taj Ganj, Agra 282 001, U.P., India. 4. M.D., Assistant Director, Central JALMA Institute for Leprosy (ICMR), P.O. Box 31, Taj Ganj, Agra 282 001, U.P., India. Reprint requests to Dr. Kiran Katoch. Received for publication on 19 April 1990. Accepted for publication in revised form on 4 December 1990.